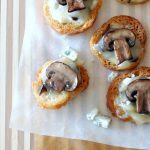 These little two bite blue cheese mushroom crostini appetizers are so easy to whip up. 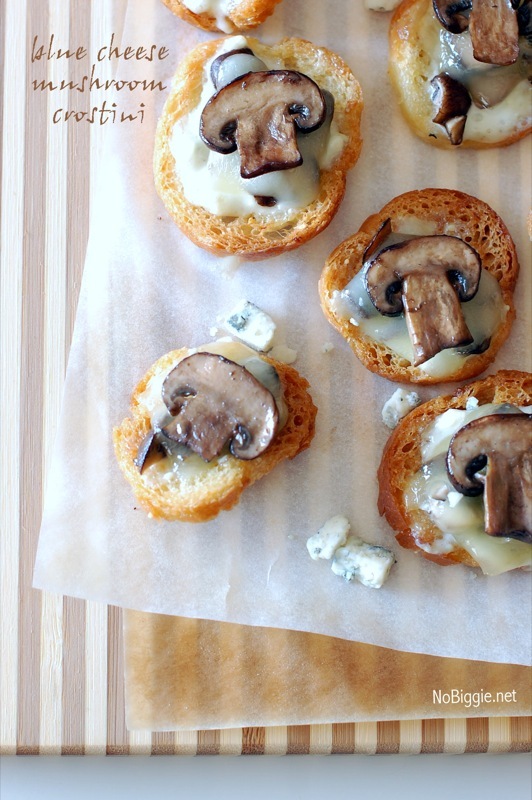 These little blue cheese mushroom crostini need to be added to your appetizer line up next time you host a party. They are a total crowd pleaser, and so easy to make. You can even use a short cut with toasted crostini toasts from your local grocery store. If you are in Utah, Harmons carries a big tub of them. Making these little appetizers so easy to whip up. Savory crunchy two bite appetizers. This recipe combines three of my favorites into one little flavor packed bite. 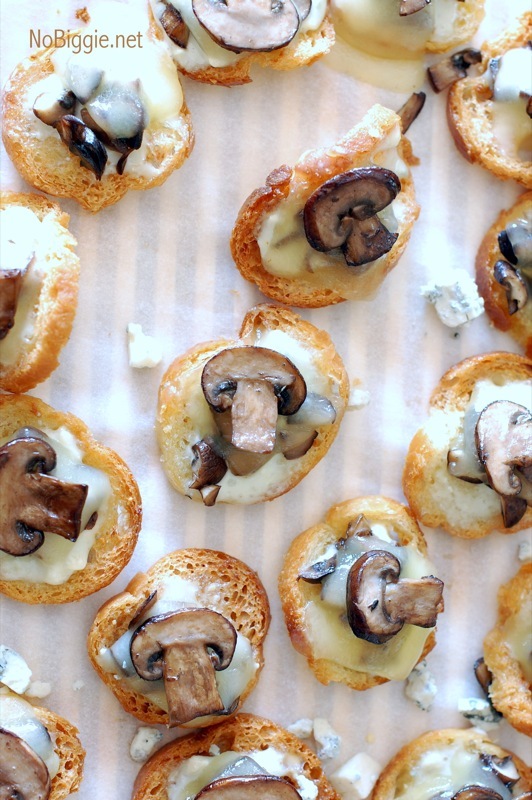 Blue cheese, sautéed mushrooms and crostini. If you are always on the hunt for great appetizer recipes, this is a good one to add to your list. For the salad dressing, we made our favorite homemade blue cheese salad dressing. Some call this dressing Roquefort, but it’s basically blue cheese. This dressing makes these tiny toasts so good! To start slice up the baguette. Preheat your oven to 350. Brush each slice with butter or olive oil. Bake for 15-20 minutes or until golden. Flip the "tiny toasts" over mid baking to ensure they are golden on both sides. Saute the mushrooms in about 1 - 2 tablespoons butter. Once cooked and cooled, chop up (even smaller) some of the sauteed mushroom pieces leaving out a bunch of the pretty sliced pieces for the tops of the crostini. To assemble the toasts. Start with a spread of the blue cheese dressing. Top with the chopped up sauteed mushrooms followed by a small slice of swiss cheese. Turn on your oven's broiler to low heat and place your pan of tiny toasts under the broiler for a short time just to melt the swiss cheese. Watch them the whole time (do not walk away during this step). To finish garnish with a small sauteed mushroom slice. *Recipe Shortcut: We love to use pre baked tiny crostini toasts found in the deli of some grocery stores. If you can find them, use them! That’s it! 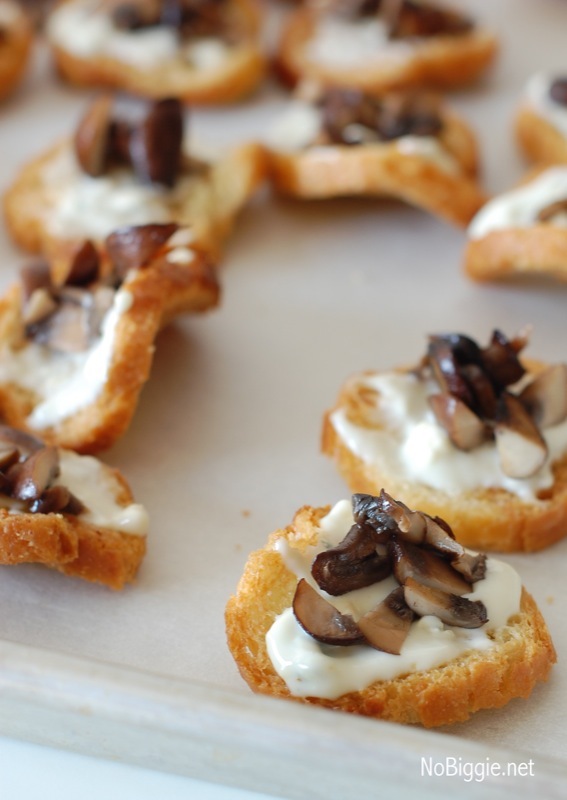 They are really so good, and they make the perfect appetizer for your next party!